Featuring Australia's finest jazz musicians, including James Morrison, Con Campbell and The Idea of North, this CD puts the gospel back into Gospel Music. A wonderful combination of traditional Gospel hymns and modern jazz. 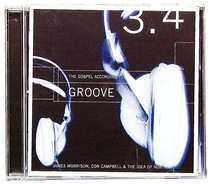 About "The Gospel According to Groove"
Constantine R. Campbell (Ph.D., Macquarie University) is Professor of New Testament at Trinity Evangelical Divinity School, Deerfield, Illinois. Previously, Dr Campbell was senior lecturer in Greek and New Testament at Moore Theological College in Sydney, Australia. Dr Campbell is the author of numerous scholarly works on New Testament Greek: Basics of Verbal Aspect in Biblical Greek (Zondervan, 2008); Verbal Aspect and Non-Indicative Verbs: Further Soundings in the Greek of the New Testament (Peter Lang, 2008); Verbal Aspect, the Indicative Mood, and Narrative: Soundings in the Greek of the New Testament (Peter Lang, 2007) and Keep Your Greek: Strategies for Busy People (Zondervan, 2010); Colossians and Philemon: A Handbook on the Greek Text (Baylor University Press, 2013); Advances in the Study of Greek: New Insights for Reading the New Testament (Zondervan, 2015); and, with Richard J Gibson, Reading Biblical Greek Workbook: A Translation Guide to Mark 1-4 (Zondervan, 2017), and Reading Biblical Greek: A Grammar for Students (Zondervan, 2017). Dr Campbell has also authored other works ranging from commentary and theology to gospel outreach, including: Paul and Union with Christ: An Exegetical and Theological Study (Zondervan, 2012), winner of the 2014 Christianity Today Book Awards; Outreach and the Artist: Sharing the Gospel with the Arts (Zondervan, 2013), 1, 2 & 3 John: The Story of God Bible Commentary (Zondervan, 2017), and Not Ashamed: 2 Timothy (Aquila, 2008). In addition to his achievements in scholarship and teaching, Dr Campbell is a gifted jazz saxophonist, who continues to play at professional level, and has recorded with such talents as James Morrison and The Idea of North. Dr Campbell is also the presenter of a seven-part documentary series In Pursuit of Paul the Apostle. Dr Campbell lives in Illinois with his wife and three children.